This Japanese style pull saw fits into an 18 mm Olfa-style snap off knife handle. The Razorsaw is well made and cuts quickly. 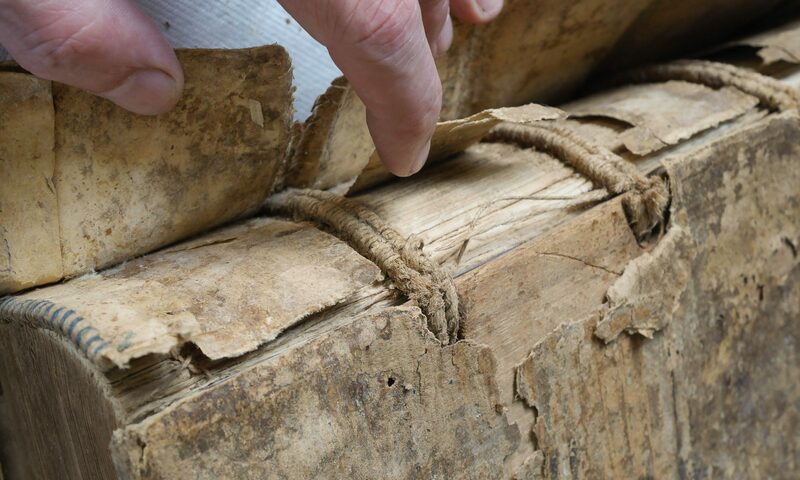 Bookbinders may find it useful to make small cuts while shaping wooden boards, trimming trenails, etc. There is another saw blade which I haven’t tried, the S-1162 serrated blade, designed for plastics, which might work on ethafoam. An easy and inexpensive way to add a saw to your tool kit. And whose inner 13 year old boy can resist the appeal of a pocketable saw? 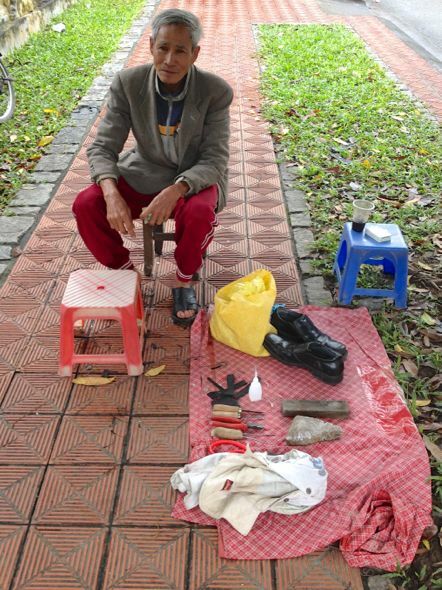 Tools from a shoe repair stand in Vietnam. 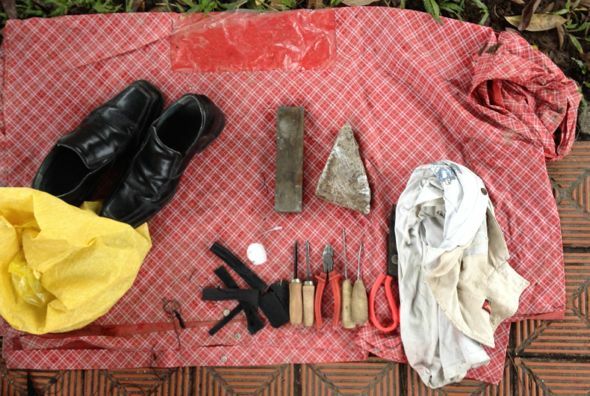 On the top row: pair of shoes, a coarse artificial and medium natural sharpening stone. On the bottom row: some rubber sole scraps, a white bottle containing some kind of adhesive, curved and angled gouges (for cutting channels into soles before sewing? ), an angle nipper, a straight and bent awl, and scissors. The cloth is both a table and can be rolled up to transport the tools. Knife made from a hacksaw blade that I purchased from the man in the above images. On the bottom the partially ground teeth that provide a pleasing grip. The steel is fully hardened throughout, above HRC 65, and I assume M2 or M3 steel, but who knows. The top and bottom of blade itself is quite planar, in contrast to the Starrett blades I use, which are dished out in the center and take quite a bit of flattening. I’ve now seen knives made from hacksaw blades of Russian, English, Brazilian, Mexican, American, and Chinese origins. It is cool to find fully hardened hacksaw steel, formed by stock reduction, used as knives around the world. I use a M3 hacksaw English Style paring knife often in my own work. I like the balance of good edge retention at low angles, initial cutting performance and ease of resharpening. A small amount of the teeth were left on the edge of the blade, giving a pleasing grip and visually reminiscent of file work found on high end European knives. There is a slight back bevel and the included blade bevel angle is 12 degrees. The back bevel might aid in the complex shapes—such as paring shoe soles. The blade angle is about 45 degrees. Although the blade itself was somewhat coarsely sharpened, it cut the rubber sole material quite easily when he demonstrated it. Overall, a basic, well made knife without superflous decoration or polishing. I wasn’t able to find any knives like this in the local markets, so I’m curious if the cobbler made this himself or if there is a Vietnamese Jeff Peachey doppleganger who peddles them. 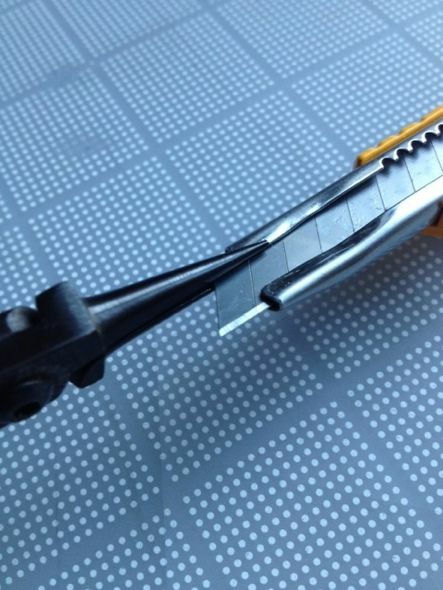 Be sure to tighten the blade holder with the blade in place! Almost every bookbinder I have met uses 9mm Olfa snap off knives. Simply by squeezing the blade holder a bit tighter with a needle nose pliers, the performance and feel of any Olfa knife is greatly improved: it doesn’t wiggle around so much, it is easier to place more accurately, the knife feels more solid, there is no more annoying rattle, and the blade breaks off more consistently. Why didn’t I think of this 25 years ago?